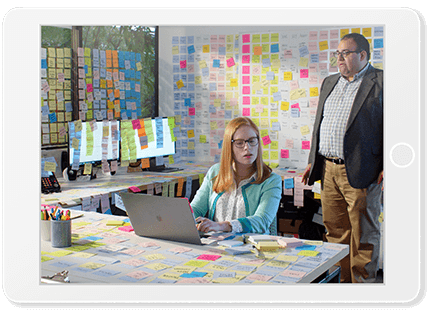 Still using sticky notes to track customer information? You need Salesforce. Sticky notes get lost. Get the customer management tool that’s searchable, accurate and easy to share. Salesforce makes it easy to track every conversation so you don’t miss out on potential deals. TAKE YOUR YOUR SMALL BUSINESS TO THE NEXT LEVEL. Salesforce is a customer relationship solution that gives you the tools to manage customer relationships, track sales processes and understand your sales pipeline so you can easily grow your business. Let your sales team focus on sales. Now you can automate day-devouring-but-important business processes, so your team can focus on selling. Find out how to create automatic email alerts, auto-assign tasks, and automate deal discount approvals. Grow your business, without all the growing pains. Winning new customers and growing your business is great — unless you’re using a solution that’s not built to scale. Salesforce is the trusted solution that's ready to scale when you are. Salesforce brings together all of your customer data from sales, service and marketing. So you can access, track, sort, analyze, and take action on it instantly, from anywhere. Stop playing hide and seek with customer data. Don’t make tracking and managing customer information harder than it needs to be. Salesforce ensures your data is in one place and can easily be updated by anyone, anytime. Get a free one-on-one consultation. Salesforce is committed to your success. Find out how we can help you find, win, and keep customers to grow your business.